Senator John Cornyn upset the vast majority of Texas voters in October of 2014 when it was discovered he promised to support both the Dream Act and Immigration Reform amnesty for millions of illegal aliens during a debate on Univision. Perhaps Cornyn did not think Texans would learn of his secretive support for the exact same kinds of amnesty for illegals that Barack Obama, Harry Reid, and Nancy Pelosi support, but we are getting the word out. Here is the Breitbart news article that broke the shocking news about Cornyn's support for illegal alien amnesty that would permanently undermine America's elections, job markets, borders, Constitution, and Republic! Sen. John Cornyn (R-TX), who is in line to be Senate Majority Whip if Republicans regain control of Congress next week, declared his support for the DREAM Act. During a KUVN Univision 23 debate with his Democrat opponent David Alameel last Friday, Cornyn said that he was a "strong supporter of immigration reform." Cornyn also said that illegal immigrant DREAMers who "are guilty of nothing other than coming with their family" should be allowed to "serve in the military" and "earn an American citizenship." A questioner noted that Cornyn has been a supporter of aid for low-income students and asked whether he would advocate "for federal aid for low-income students who have benefited from the DREAM Act" in Texas. Cornyn, who is on his way to reelection, said that he is a believer "that education is the way out." He then mentioned that he had "indicated earlier that children who came with their parents into the country and did not comply with our immigration laws--they are guilty of nothing other than coming with their family." He reiterated, "We ought to provide them an opportunity not only to go to school, but to eventually serve in the military or complete a college education and earn an American citizenship. I believe that." As Breitbart News noted, Cornyn also suggested in a recent interview with the Austin American-Statesman that conservatives like Sen. Ted Cruz (R-TX) should compromise with Democrats on amnesty legislation if Republicans control Congress to show that the GOP can "govern." According to the left-wing ThinkProgress, Cornyn's VIP guest at the debate was former League of United Latin American Citizens (LULAC) President Hector Flores. Beatrice Martinez of the Dallas Hispanic Chamber of Commerce told ThinkProgress that she supported Cornyn because Alameel's calls for more border security turned her off. Last edited by imblest; 10-28-2014 at 11:26 PM. US Senator John Cornyn Just Announced on Univision He Supports Amnesty for Illegals! 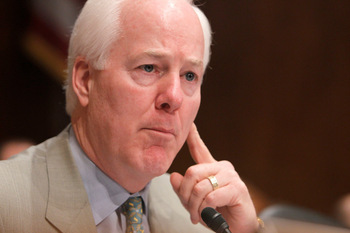 John Cornyn Flip Flops, supports Path to Citizenship Amnesty with his Bogus Amend.